PaintScratch sells Audi TT touch up paint for the years listed in the table. Click your Audi TT year to see available touch up paint colors. We guarantee Audi TT touch up paint will match the original factory color chip on Audi’s manufactured after 1985. Order Audi TT paint pens, brush cap bottles, and spray cans from our secure online store. For small TT scratches, the paint pen works well. For slightly larger Audi TT scratches and chips, a brush bottle is best. For larger paint repairs, a Audi TT spray paint can will deliver best results. Touch Up Paint Videos - Watch and learn how to apply touch up paint to your Audi TT. How To Apply Touch Up Paint - Detailed instructions for using automotive paint on your Audi TT. Audi codes can be difficult to find. 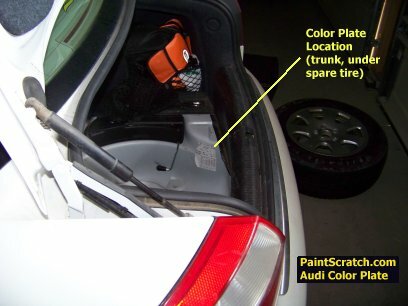 Most Audi color codes are going to be somewhere around the spare tire area. They are printed on a paper color id tag which is guaranteed to fall off and disappear just when you need to find it. I don't know how much extra a metal plate affixed to the driver door jamb would have cost, but apparently too much. 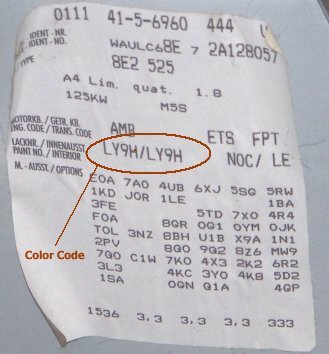 The color code above is actually two different color codes, LY9H and P1 which can be used. Typically most Audi's have the LY9H/ but occasionally we see the P1. Why did they do this? Who knows! LY9H corresponds to Polar White Clearcoat Again, the P1 is also used on some Audi's for the same color. Really old Audi can be nearly impossible to figure out. Plus, they are discontinuing some of these toner colors so custom matching is the way to go. Audi, like all manufacturers, uses the exact same color across many models and then will have a different color name for each model. It's the same paint! This is why the color code is so important to order the correct paint. For example, LY9H above we call White Clearcoat It could also be called Moonstone Clearcoat, etc. depending on what the marketing department decided to call it. Please read through the following list of Audi touch up paint tips for best car paint repair results. The pints, quarts and gallons of basecoat, midcoat, clear and primer are ready to spray and do not require thinning. If you get paint on your skin, remove with paint thinner and wash thoroughly with soap and water. Do not try to use the paint pen on areas larger than a pencil eraser. Larger areas must be sprayed. Paint can easily leak out of the paint pen if you do not use it correctly! Do not try to brush areas larger than a dime. Larger areas must be sprayed. Use an approved automotive paint respirator and WEAR safety goggles and gloves when handling automotive paint to protect your eyes and skin!! Please read the information below for best results. When spraying, always test for paint compatibility. Paint an inconspicuous part of the vehicle, let dry and see if there is any reaction. Do not spray our paint over enamel paint that is less than two years old. Do not spray primer, paint or clearcoat in direct sunlight! Make sure you use SEM Adhesion Promoter if you are spraying a non-metal surface. Failure to do so will result in the paint peeling off within a few months! Need paint for another vehicle? Find it here. Humble, TX "I received my paint today and the color is a very good match. Thank you very much." Kailua-Kona, HI "I have used your product many times & it is always on the money. Thanks"
Bennington , VT "Thanks for all your assistance in this matter. Your regular e-mail correspondence has been reassuring and representative of the great customer service your company provides." Athens, GA "Thanks Collin every one in the club says you are the best and you really do stand behind your word. Thanks"
Dallas, TX "Fantastic product! Excellent service! Color match on the original order was perfect, just wish I had bought enough paint the first time! Thank You."